I’m not one to be defeated easily. My poor track record with Brownies has never sat well with me. When I was asked by Dr Oetker to enter their Great Chocolate Bake competition, I knew exactly what I was hoping to achieve. As soon as you mention the word ‘Brownie’ people turn to mush, mmm’ing and aah’ing. Well, I wanted them to do that over my recipe too – and by jove! I might just have got it! Dr Oetker are challenging home bakers to come up with the ultimate chocolate cupcake – they sent a bunch of us some delicious ingredients and off we went. The prize is a fabulous trip to New York … and obviously the satisfaction of knowing I’ve finally cracked Brownies! I’ve heard about S’mores for ages now but don’t quite fancy the cracker part of the recipe – so I came up with the Marshmallow/Brownie combination – I also wanted an extra dimension so went for it and added a Ferrero Rocher for decoration too. The recipe and instruction for making the Brownies is below – I only filled the cases 1/3rd full – they don’t rise too much but the last thing you want is them spilling over. Once you have spread your frosting over them and added the Ferrero Rocher they are quite tall anyway. They are really rich – believe me, no-one will moan about the case not being full! 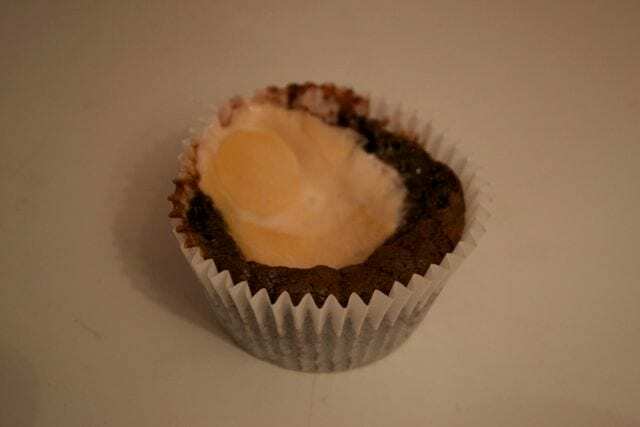 I’m not going to lie, these are not pretty cupcakes when they first come out of the oven – the melted marshmallow oozes into the Brownie and it is impossible not to get a dip in the middle. As long as you know that is going to happen though, it is easily fixable. Bear with … It gets prettier! I added a marshmallow frosting – I didn’t want to start adding too many flavours by mixing a dairy frosting. Marshmallow frosting is super simple – just melt some mini marshmallows in a pan slowly and spread over the cupcakes. Beware, it does set really quickly though – you can add a teaspoon of glucose syrup if you want it to stay runny for that little bit longer. The Tulip Cupcake Cases are an ideal way of disguising any rough edges on your original cupcake case. I bought mine but they are easy to make too – Tutorial coming soon! 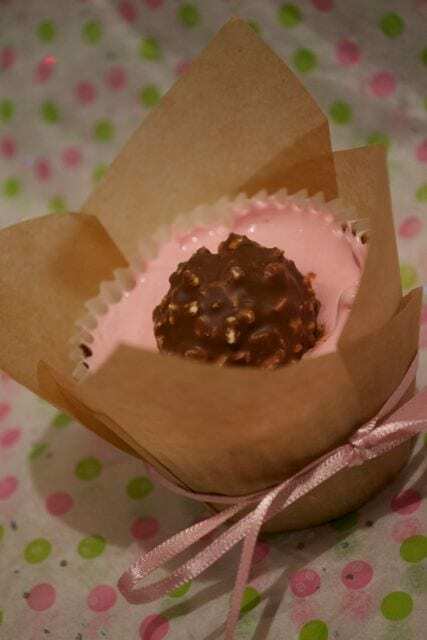 I finished with a pale pink ribbon to match the marshmallow frosting and added the Ferrero Rocher and I was done! Yum! Preheat the oven to 180C and line the Cupcake Tray with the cupcake cases. Break the chocolate into small chunks and add with the butter to a medium sized pan. As soon as the butter and chocolate have melted, remove from the heat and whisk in the 2 types of sugar until combined. 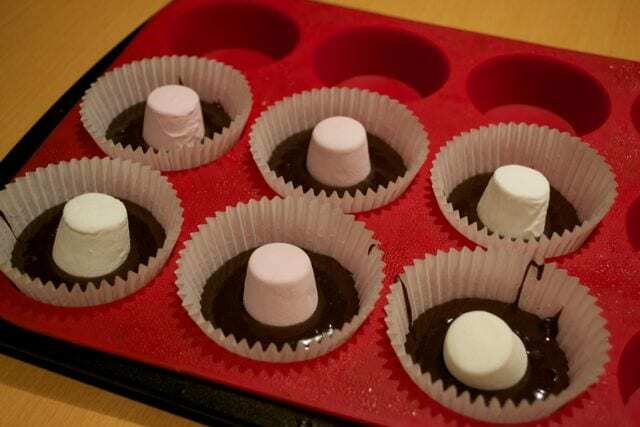 Fill each cupcake case 1/3rd full and place a large marshmallow in the centre of each. There is no need to press down. Bake in the centre of the oven for 18-20 minutes. Just before decorating, add the mini marshmallows to a small pan and heat slowly - do not allow to boil. As soon as runny, spread a tablespoon of the mixture over the cooled cupcakes - I used the multi coloured Marshmallows and the frosting turned pink. If you use the white ones, you can add a small amount of food dye to match your colour scheme. Work quickly, they soon set! 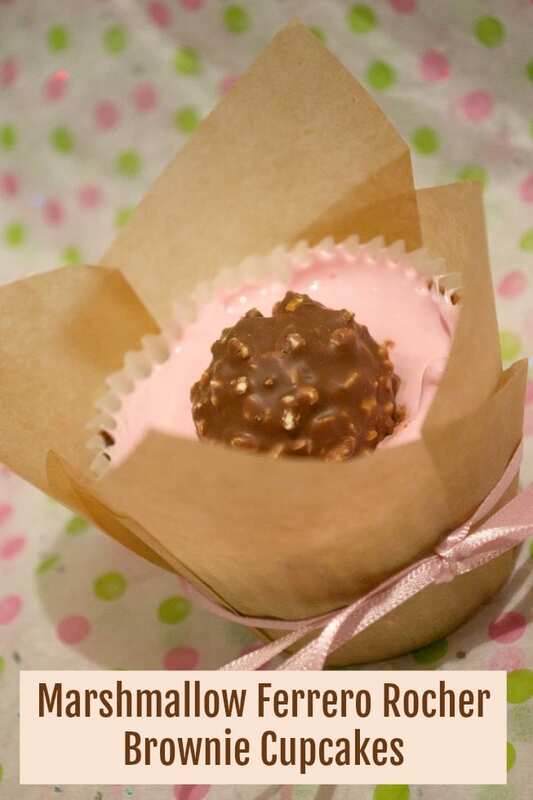 Add a Ferrero Rocher on top and place the cake inside a Tulip wrapper - Instantly transformed! Disclosure: I received no payment for entering or promoting this competition. I did receive a Chocolate Hamper with some ingredients to use though. I had complete free reign on which recipe I used and made this one up. I highly recommend these cupcakes but take no responsibility for any growing waistlines! Ferrero Rocher is like a cherry on the cake. It completely compliments the brownie. Looks amazing! !